We are continuing through the Jacques Herbin Essential Inks with Terre d’Ombre. The ink is available in 50ml bottles and cartridges. 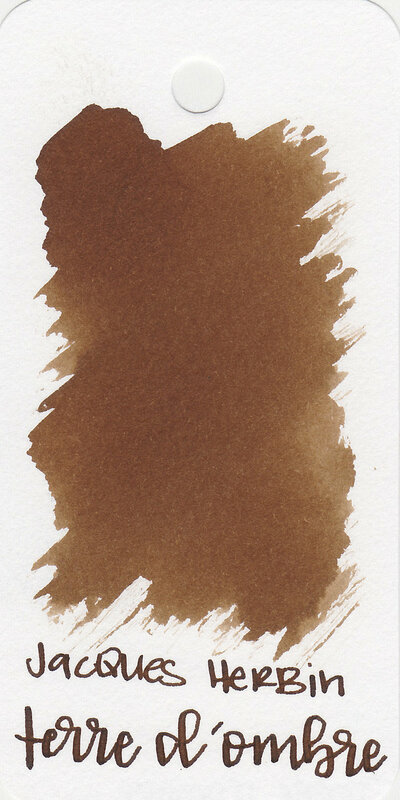 Terre d’Ombre is a medium brown with a hint of orange. In large swabs the ink appears much darker than in writing. Water resistance: Low-the orange hues wash away first. Other properties: low shading, none sheen, and no shimmer. On Staples 24 lb copy paper there was feathering in all nib sizes, and a little bit of bleeding, so it’s not an ink I would recommend for cheap paper. Terre d’Ombre is closest to Taccia Tuchi Golden Wheat, but Golden Wheat has high shading while d’Ombre has low shading. Click here to see the J Herbin inks together, and click here to see the brown inks together. I used a Montegrappa Copper Mule with a fine nib on Tomoe River paper. The ink has an average flow. Overall, it’s a nice ink, but I was hoping for more shading than I got. It’s an average brown ink, nothing that stands out to me to warrant the high price tag. Disclaimer: I purchased a sample of this ink from a group buy. All photos and opinions are my own. This page does not contain affiliate links, and this post is not sponsored in any way.